Are you pre-diabetic, diabetic, or know someone who is struggling with Type 2 diabetes? Wondering what type of food you should or could eat and how to best manage or improve your condition? 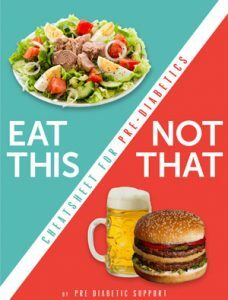 For those who are pre-diabetic or know they have a diabetic family history and are looking for ways to make changes that are manageable, sustainable, and will help them create a healthy lifestyle to prevent or overcome diabetic health issues (such as high blood pressure or diabetic retinopathy), we wanted to share some recipes and suggestions for building daily balanced meals. There can be so much information that’s overwhelming, so we’ll try to keep this simple and make things easy. 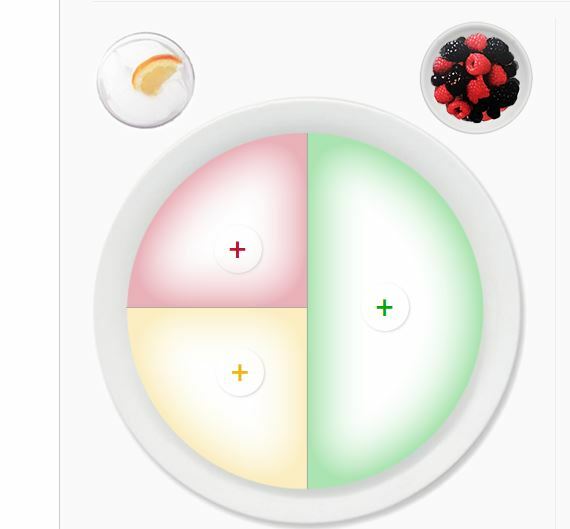 The American Diabetes Association (see their Create Your Plate guide) suggests creating a plate guide where half the plate is made up of vegetables (ones that are not starchy) – such as spinach, zucchini, broccoli, asparagus, celery, cauliflower, green beans, lettuce, mushrooms, and kale. Next divide the other half of the plate in half again, and in one section put protein (fish, chicken, eggs, turkey, tuna, cheese, tofu, etc). And in the last small section place a helping of some grains or starchy foods — such as rice, potatoes, pasta, peas, beans, corn, quinoa, or tortillas. In addition to this, one small serving of fruit or dairy is suggested to round out the meal, along with a low-calorie beverage like iced tea, coffee, or water. Healthy fats can also be added in small amounts (i.e. avocado, nuts, or seeds added to a salad). If you are wanting to track carbs and calories for your chosen foods with each meal, check out the Carb Counting and Meal Planning booklet from Novo Nordisk. Lisa Statzer of Prediabetic Support has a fabulous program that helps individuals who are pre-diabetic make the needed changes to their diet and lifestyle to avoid the many health issues of the full-blown diabetic condition. She is so encouraging, helpful, and knowledgeable on the topic, and you can download her free Eat This, Not That guide on her website. 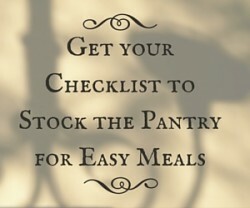 We have lots of diabetic friendly recipes right here on Dish Dish – which you can save to your own free recipe box account and use to create your grocery list each week – saving you time and sanity when planning meals. 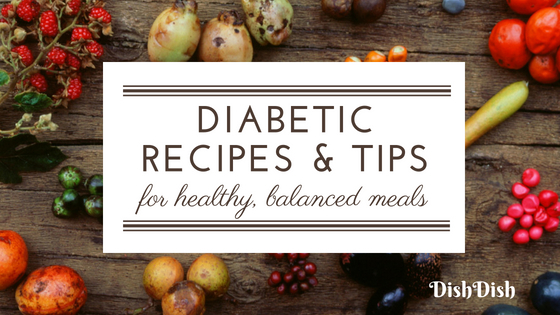 Here are a few diabetic friendly breakfast, snack, lunch, dinner, and even dessert recipes. Please be sure to comment below with which ones you’ve tried and let us know if you have other ideas and suggestions. A simple salad made with arugula leaves, fresh strawberries and crumbled feta cheese; topped with a homemade strawberry vinaigrette (or use your favorite one from the store). Sauteed onion and garlic are mixed with chopped broccoli, bell peppers, and seasonings with beaten eggs. Pour into a dish and bake for about 30 minutes for a nice, healthy brunch, lunch or dinner. Serve with some salsa and avocado for even more flavor. Dish up this delicious soup with diced turkey, a little bit of whole wheat orzo (optional), carrots, onion, celery, sweet pepper, peas, broth and lots of seasoning. Though it will take a few minutes to do the prep (chopping and dicing ingredients), cooking time is only about 30 minutes, making it a relatively quick meal to get on the table. And it’s freezer friendly – so make a large batch and freeze the extra for pulling out on a day when cooking sounds too onerous or time-consuming. Fresh blueberries baked for about 20 minutes with a crumbled oat topping for a quick and easy dessert that’s already in small portions so you won’t be tempted to over-indulge. Enjoy! This yogurt-based dip with green onions, mint, red chili, and a dash of lemon is a refreshing dip with your favorite veggies – celery, cucumber, broccoli, grape tomatoes or asparagus. It also makes a nice “sauce” with your favorite grilled meat.